This iteration of New Demands? in New York, commemorated the New York Shirt Waist Strike of 1909-1910 and the Triangle Factory Fire of 1911. In 1909-1910, over 20,000 mostly Jewish and Italian immigrant women garment workers went on strike for better working conditions, winning the right to a 52 hour work week; a wage increase; four paid holidays a year; and the creation of a grievance committee to moderate between workers and factory owners. The agreement that ended the strike was not signed by the owners of the Triangle Waist Company, and a year later, a fire broke out at the factory that killed 146 young women workers. 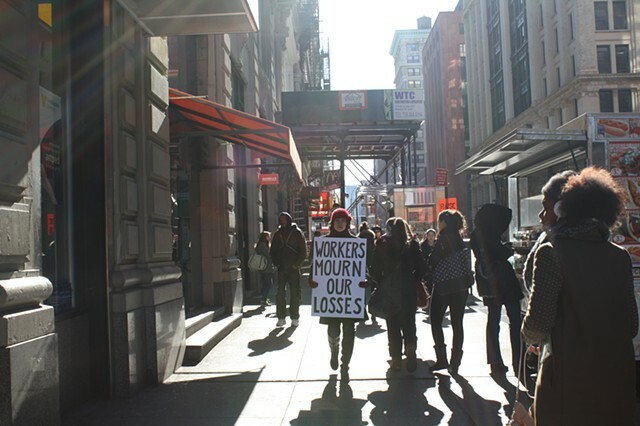 I walked a route that connects sites of historical importance associated with these events, linking the history of workers' rights in the garment industry and the American labor movement to current struggles to improve working conditions in the garment industry. Performed in collaboration with Grace Exhibition and Performance Space.